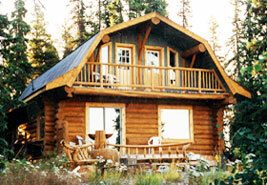 Escott Bay Resort,on Anahim Lake, offers a full range of accommodations. 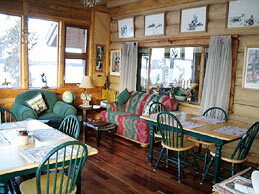 The large chalet, which features four bedrooms is fully serviced. Our other six units range in size from smaller log cabins to larger two bedroom cottages. All come fully equipped so that all you need to bring are your own personal belongings. The lodge itself has two guestrooms upstairs, and guests share a large bathroom with an old fashioned tub. All of these units have indoor bathrooms with showers. In addition, there is a central building with washroom, shower and laundry facilities for all our guests. 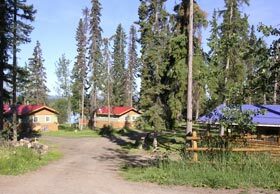 Several of our cozy cabins sit right on the shore of Anahim Lake with a spectacular view of the Coast Range Mountains. A large screened gazebo is available for the use of all of our guests. 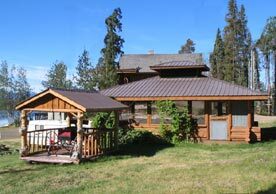 It is centrally located and has a fire pit, two barbecues and a large propane griddle. An area where you can wash your dishes and clean up is off to one side. And for the convenience of our guests, there is also a refrigerator for your use. 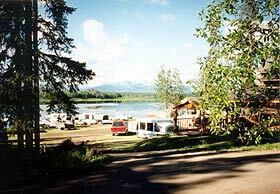 We have two campgrounds to choose from at Escott Bay Resort. All of our sites have water and power. There is also a sani station. For the smaller children, there is a playground located next to the front campground. Even though all units have full cooking facilities, meals are available in the "Corral" Dining Room in the lodge which is a licensed facility. 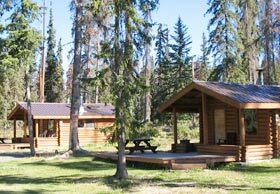 Your choice of accommodations include smaller log cabins, lakeside cottages, and for larger groups, our large log chalet. Prices range from $85.00 to $160.00 per day based on double occupancy.